Within our range of timers and counters you will find time delay relays and time switches as well as mechanical and electronic counters to create automated and energy efficient power management systems to meet your specifications. Within this section, you will find market leading products from Crouzet and Omron among others. Counters – typically used for counting the number of pulses of an input during a specific time period. Counters have a memory so they can store previous events. Counters must be synchronous or asynchronous. There are six common counters which are as follows: binary ripple counters, ring counter, BCD counter, decade counter, up and down counter and frequency counter. DIN Rail time switches – control the on and off positions for lighting, heating and cooling equipment. 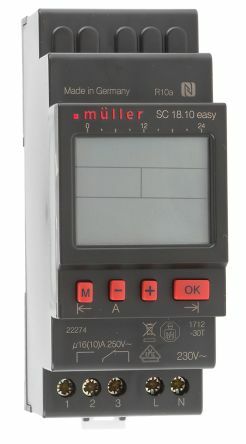 They serve the same function as any timer switch but are mountable on to a DIN rail. Timer light switch – an automatic light-switch that can be used to control the timing of certain lights at certain times. Timer light switches are available in multiple types which control lighting based on movement, time of day and ambient lighting light levels. Mechanical counters – operate via mechanical components and count the following types of change: revolutions, rotations, strokes and how many times a button has been pushed. They typically consist of a series of discs mounted on an axle, with the digits 0 through 9 marked on their edge. Plug-in switch timers – these style of timers plug directly into a domestic outlet and provide an additional plug in which to connect the device which you want to control. Typically these sockets are used to control lighting. Plug-in switch timers are available in either digital or mechanical styles. Both styles allow for multiple time ranges to be added. Surface mount time switches – similar to their plug-in counter parts, but mountable in a location other than the outlet its connected to. Typically used to control HVAC, laboratory equipment, outdoor lights and immersion heaters. 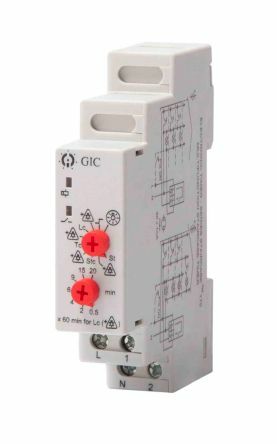 Time delay relays – Control relays with a timer built in. Time delay relays are available in various application types such as: on delay (voltage is applied after a set period of time). Off delay (a trigger is used to activate the output contacts and start the timer. When the timer completes the cycle the contacts are de-energized). Repeat cycle (when a voltage is applied to the relay the timer starts. At the end of the time cycle the time contacts change state again until the timer starts again). Holiday function16A switching capacityPermanently ON or OFF with manual switchManual overrideUnrestricted block programming of daysFully automatic daylight saving timeElapsed time and pulse counterPulse function: Automated switch OFF timer up to 59:59 (mm:ss)Security by PIN coding. 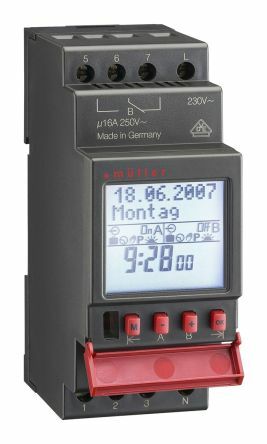 Multi Function/Mono Function Staircase Timer in Compact 17.5mmTime Range: 0.5 min-20 minLong Run mode with Timer range from 0.5h-20hFunctions with Pre-Warning, Cut-Off & Release DelayMaintenance Mode AvailableSwitch indication (Glow-lamps/Pilot lamp) upto 50 mA3 Wire &4 Wire Configurations.